Police are linking a string of thefts from vehicles in church car parks reported in villages south of Sleaford. 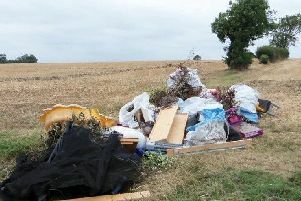 The communities targeted are said by police to have all been close to the A15 between Sleaford and Bourne. The first incident is said to have occurred between 3pm and 3.45pm on Thursday last week when the window of a vehicle was broken and items stolen from inside at the car park of Walcot church. A small beige vehicle was seen parked nearby. Anyone with information should call 101 referring to incident 347 of October 4. A small beige hatchback with three male occupants was also seen shortly before a theft of items from a car parked at Kirkby Underwood CHurch at 5pm the same day. A rear window was smashed to get in. refer to incident 363 of that date if calling. The third theft is thought to have been committed between 12noon on Thursday and 7.45am the next morning when burglars broke into a remote residential property at Sempringham Fen, near Billingborough by smashing a window. refer to incident 71 of October 5 for this burglary. PCSO Sandra Brommell of Bourne and Billingborough policing team said: “The three crimes have been linked to the small beige hatchback and three male occupants. “Did you see this vehicle last Thursday? Did your CCTV capture it as it drove suspiciously around our villages? “Did you make a note of the registration number?